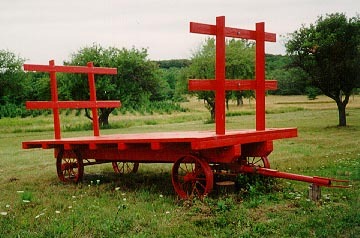 Thank you for your interest in Red Wagon Farm. We are located on the road to Altamont, Route 146, 1/4 mi. west of the junction of Routes 146 & 158. This is the perfect year to get a fresh Christmas Tree. Unlike pre-cut trees, you know this one will last. We have heard of people who bought pre-cut trees the needles fell off their tree in the middle of December! The problem is that many trees are cut in early November or even late October and haven't been watered properly since. When you cut your own, you know it is fresh.